In large bowl, beat sugar, butter, vanilla and egg with electric mixer on medium speed until light and fluffy. On low speed, beat in flour, cocoa, baking powder and salt until blended. On lightly floured surface, shape dough into 6x21/2-inch roll. Wrap in plastic wrap; refrigerate until firm, about 1 hour. Heat oven to 350°F. Spray cookie sheet with cooking spray. Unwrap dough; cut into 1/4-inch slices. On cookie sheet, place cookies about 1 inch apart. Carefully insert lollipop stick into bottom of each cookie. Bake 12 to 15 minutes or until set. Cool 10 minutes; remove from cookie sheet to cooling rack. Cool completely. 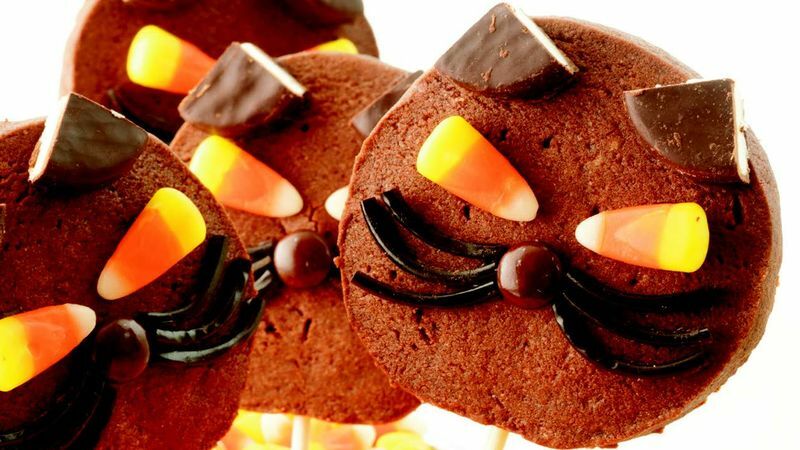 Using chocolate topping, attach peppermint patty pieces for ears, candy corn for eyes, chocolate candies for nose and licorice pieces for whiskers on each cookie.